Social Finance arranges p2p student loans from alumni investors to graduate borrowers in the US. Currently students from 78 schools are eligable to apply for a Sofi loan in order to refinance their student loan debt. Social Finance says that it has generated more than 60 million US$ in loan applications and is on track to commit more than 200 million US$ in 2012. Social Finance was founded only one year ago and now receives a staggering 77 million US$ series B funding from Baseline Ventures, Renren and DCM. First figures about lending activity on p2p lending service for student loans People Capital (related articles: People Capital) which launched earlier this month say that so far five to six students received loans for a total of 100,000 US$ from 5 lenders with another 45 students awaiting funding. Lenders must have accredited investor status to lend. Financial institutions can sign up as lenders, too. More details in this New York Times article. Vittana (sea earlier coverage ‘Education microfinance – Vittana funds students worldwide via p2p lending‘) has published the following video, where students that got loans through Vittana tell their story. Currently Vittana lists 11 open loan listings. 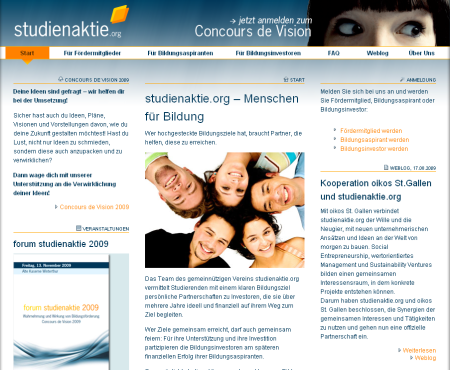 Studienaktie.org is a Swiss non profit association offering p2p lending to students. The name translates to student share and is rather fitting, since the concept literally allows the investor to invest in a student and profit from his career development. Unlike with other p2p lending platforms for students, investors do not really give a loan, but rather buy a share offered by the student. An example illustrates how this works out. A student might offer to sell you a share for 100 CHF (approx 97 US$) now while in return promising to pay you 0.25% of the annual salary he will earn in 2017. Meaning if his salary will be 80,000 CHF in 2017 the investor will be repaid 200 CHF for his share then. So this is really a bet of the investor on the students career chances. To help on the selection investors can browse anonymous dossiers of the students and contact them. Chances for a positive ROI a probably good since Studienaktie originated at the university of St. Gallen, which has an elite reputation. Studienaktie is open to students of other universities, too. The contract is signed directly between investor and student and the payment is directly facilitated between the 2 parties. Studienaktie only provides the platform. Investors pay a yearly membership fee of 100 CHF to participate. The aim of the non-profit organisation is to enable more and better education. People Capital, a p2p lending service for college students to obtain student loans via an online lending exchange, announced that it has closed a 500,000 US$ round of Series B funding. The Serious Change fund, helmed by investor Josh Mailman, led the round of financing. People Capital will use the funding to accelerate technological development of its peer-to-peer lending platform which will offer a unique solution for students to finance their college educations. This platform is poised to provide funding for students in the fall 2009-10 academic year. “We are delighted to welcome Serious Change as our new financial partner,” said Tom Shelton, CEO of People Capital. “With this financial commitment, we will continue to develop our proprietary lending technology which, when launched, will help students receive more favorable private student loans for high education needs.” “Although peer-to-peer lending technology is not new, we had been looking for a company that could bring the technology to the next level, one that offers a responsible alternative to students wishing to take out loans for college,” said Josh Mailman, head of Serious Change. “After extensive research, seeing the technology in action, and meeting company executives in person, we became convinced that People Capital presents by far the most exciting opportunity of companies in the peer-to-peer lending space. 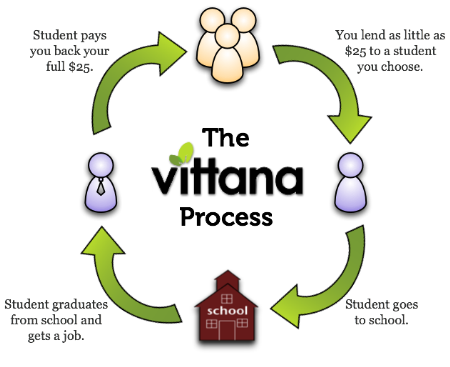 US based non-profit Vittana.org wants to use the power of p2p lending to bring student loans to the developing world. It works like Kiva. For as little as 25 US$ a lender can hellp to fund a loan. Vittana partners with local MFIs who evaluate students for past academic achievement, commitment to success, and ability to repay. All 3 listed loans in Paraguay are already fully funded, but I intend to fund loans as soon as new loan applications are listed. TuitionU.com, a wholly owned subsidiary of Cology Inc., today announced the acquisition of GreenNote (see earlier description), a p2p lending service for student loans. The agreement enables TuitionU.com to add peer-to-peer lending technology to its student loan options. TuitionU says not-for-profit credit unions that are currently featured will be joined in the future by foundations, charities, corporations and other community lenders to further enhance the network. People Capital (website people2capital.com) receives second financing round from private equity firm Radcliff Group Inc.
People Capital plans to launch a peer to peer student loan platform in 2009. We have built our model with the specific profiles of top international MBAs in mind. Our close partnerships with the schools means that we are able to approve the vast majority of applications and are able to lend to participants from most countries (…). Provided you are accepted at one of our partner schools, it is very likely that we will be able to approve your loan in principle. However at this stage it is important to remember that we are still in pilot stage and thus our ability to provide funding is limited by the size of the funding pool that we have. But that’s not all. Lenders are required to be alumni of the school, too. Minimum investment amount is 10,000 Euro. Loan term is 7 years with a 16 to 18 month grace period. Interest rates are tied to the underlying base rate. Currently only borrowers and lenders from INSEAD are accepted. The currency of the loan balance is determined by the currency in which tuition fees for the university are paid. If you are only lending to one university, your funds will be held in that currency alone. If you choose to spread your funds to other universities, we will convert your funds at the best available rate (and with your consent). Prodigy Finance was founded by Cameron Stevens (CEO), Ryan Steele (COO) and Miha Zerko (CTO).